Under a full moon, the sky lightens behind the quiet trees of winter, their noble forms silhouetted in the early mist. 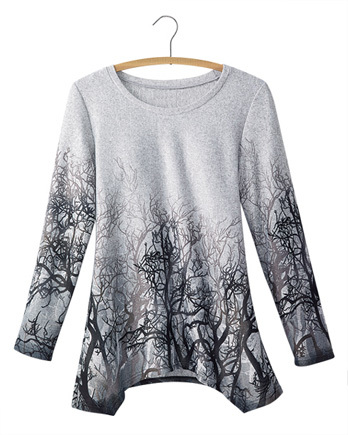 Cozy mid-weight knit tunic enchants with the graceful forms of winter trees. Curved hem approx. 29" long. Imported. Soft poly/spandex; machine wash, dry flat. Sizes S-XXL. I usually wear a Medium but after reading some of the reviews, I decided to order a Small and I'm glad I did; it fits perfectly. This top is lovely! It exceeded my expectations both in quality and softness. This top is very comfortable and flattering and exactly as pictured in the catalogue. I love it. This is a gift for my granddaugther and as I wrapped it I felt it so soft. The color and design are beautiful. Wonderful top that washes well and dries wrinkle free. I absolutely love this shirt! The print is unique and it is super soft. I do feel it runs a bit large though.